Our Easy Christmas Crafts Paper Doily Flower Ornament can be easily and inexpensively made with just a few simple materials and tools. 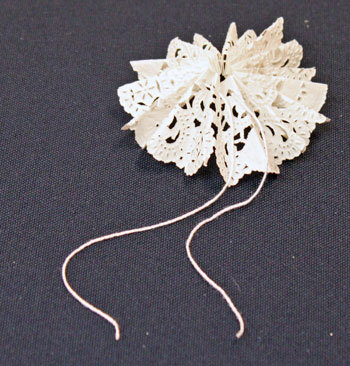 Each paper doily flower ornament takes a small paper doily, a short length of yarn or string and a few short pieces of curling ribbon. The tools are also simple - scissors and a ruler are the main tools. 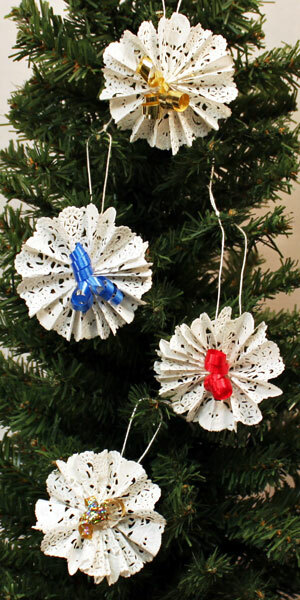 Take a look at these four finished Easy Christmas Crafts Paper Doily Flower Ornaments hanging on the tree. 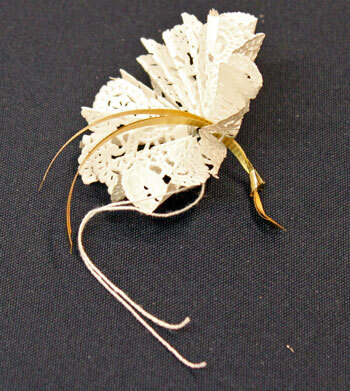 The paper doily flower ornament is simple. By using different ribbons, the flowers bloom in different colors. 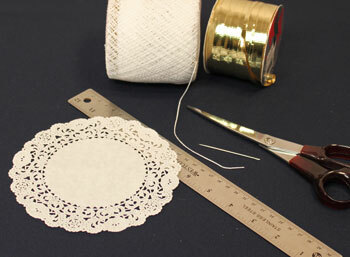 Fold the six inch diameter paper doily in half with the wrong sides together. 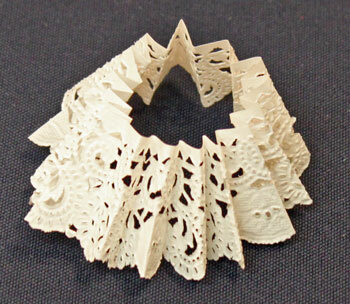 Fold the paper doily in half again making four equal quarters. 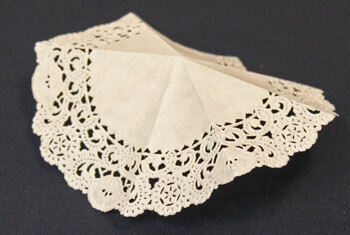 Make two more "half" folds such that the folds divide the paper doily into eight sections. 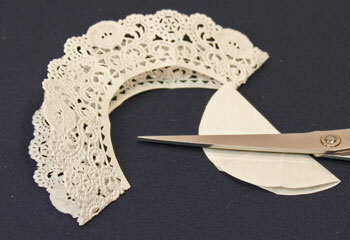 With the paper doily folded in half, cut away the center of the doily. 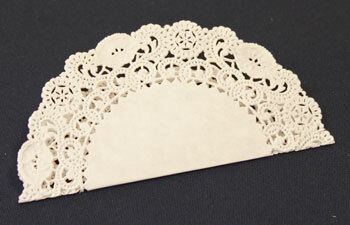 Leave 1/8 inch of the paper next to the paper doily's design. Fold between each of the previous folds. 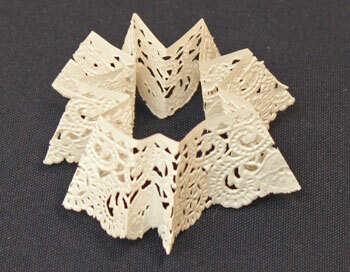 This makes sixteen different folds in the paper doily design. One more time, fold between each previous fold. 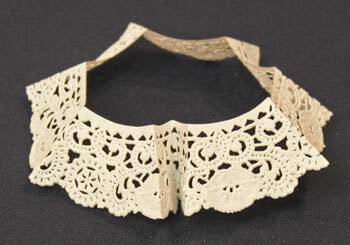 This makes 32 back and forth folds in the paper doily's edge. Make sure all of the folds are creased. 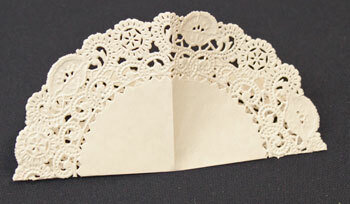 Turn the paper doily such that the wrong side faces outward. 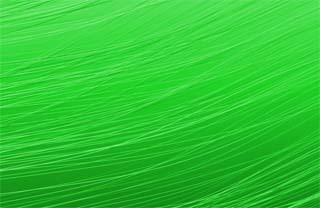 Measure and cut your string or yarn to 12 inches. I used #10 crochet yarn. 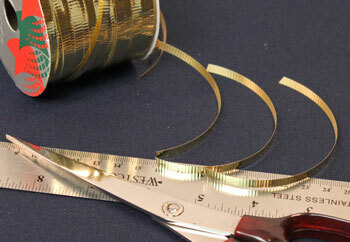 If you want to use thread, use several strands to prevent the finer thread from cutting the paper. Push the yarn through the holes in each of the folds near the inner edge. The holes are large enough to push the yarn through easily, but a needle makes it even easier. 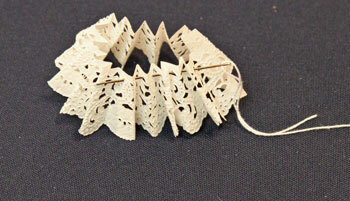 After the yarn encircles the paper doily's inner edge, center the paper doily by pulling the yarn evenly. 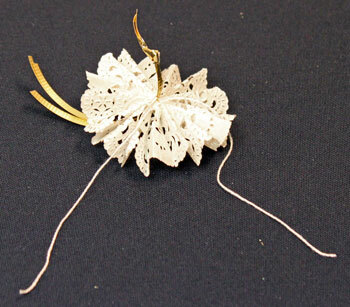 The Easy Christmas Crafts Paper Doily Flower Ornament is almost, but not quite, finished! 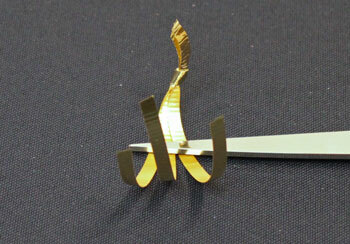 Cut three pieces of the curling ribbon four inches long each. Holding the three ribbons together, tie a knot near one end of the ribbons. 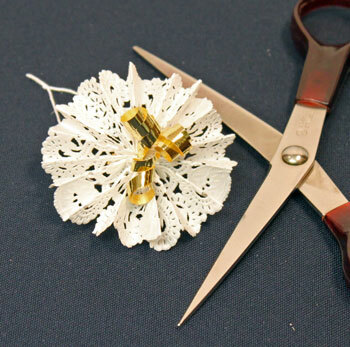 Push the ribbons from the back toward the front through the hole in the middle of the Easy Christmas Crafts Paper Doily Flower Ornament. The knot in the ribbons will be on the back of the ornament. Pull the yarn gently yet firmly to gather the paper around the ribbons. Tie a square knot in the yarn near the paper to secure the folded paper. Tie a knot in the yarn ends to form the hanging loop. 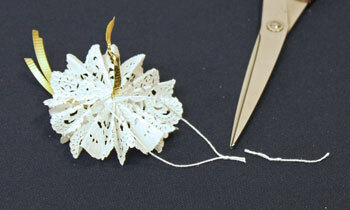 Turn the Easy Christmas Crafts Paper Doily Flower Ornament over to access the ribbons. Holding the knot on the back side, use the scissors to curl each of the three ribbons. 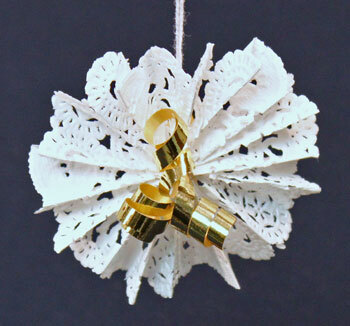 Hang the Easy Christmas Crafts Paper Doily Flower Ornament and admire its dainty and pretty simplicity. With just a little time and a few inexpensive materials your holiday decor can bloom with a variety of this Easy Christmas Crafts Paper Doily Flower Ornament project. Whether young or young-at-heart, people of all ages can enjoy this easy Christmas crafts project for a paper doily flower ornament. Both simple and pretty, this Easy Christmas Crafts Paper Doily Flower Ornament is easy, fun, and inexpensive for anyone to do.